“Make it pop!” We understand exactly what that means. In the competitive world of retail, companies are always looking for that edge. Our clients want the eye catching print that best communicates their marketing message to their targeted consumer. We help retail and shopping malls bring back their customers with eye-catching graphics that WOW their shoppers with bright and brilliant promotions. Ever-changing graphics keep a store fresh and sharp while promoting what you want your customers to notice within a department or the entire store. It is not just limited to announcing upcoming sales, events, or store openings. Enhance your customers’ over-all experience with displays, shelf talkers, cut-outs, window graphics, sale banners, and POP material. No matter the purpose – to inform, direct, or attract you can benefit from full-color graphics that draw attention to products and promotions, thus increasing your sales and customer return rate. Look down to pick up your sales. Studies show that floor graphics increase product sales. 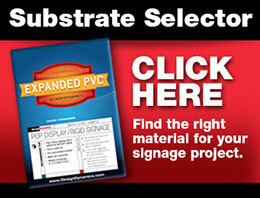 Why not add a splash of color to your aisles to promote a new product? The space is there … use it! Design Dynamics production and fulfillment capabilities make retail promotion launches easy and cost effective. Talk to a design consultant about the variety of options available to ensure your store is the best looking in the mall.